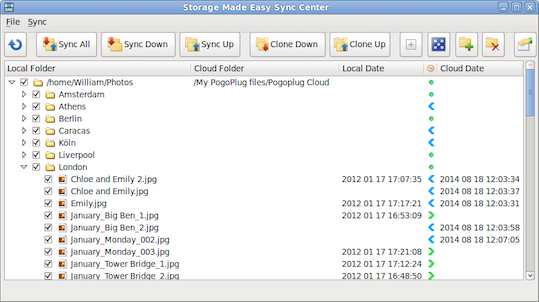 I just installed the SME Cloud tools on my Raspberry Pi using the file from the storagemadeeasy-Homepage. After launching the SME Sync Center, I accidentally used wrong login data. Now, everytime I start the SME Sync Center, it tells me: "Unable to authenticate. Sorry, your login, password is not correct or user is not active." I can't reconfigure my data and I don't know where to find the configuration file. I can launch the other SME services and define my data there, but it doesn't affect the Sync Center. Login and password can be changed in Properties window. Open the Sync Center and press button "Properties" (if you don't see it then need to increase size of window). I can't do that, because I can't open Sync Center. When I try to, it gives me the error message from my first post. What package have you installed (Ubuntu 13.10, Ubuntu or Debian)? I think that you need to install package that is for Ubuntu 13.10. The Debian package, because I use it with Raspbian, which is based on Debian. None of that DEB packages was tested with Raspberry Pi. I guess none of the Ubuntu packages either? BTW, SME Client and SME explorer are working. I'll try a new installation. But isn't there some config-file, which could easily changed?